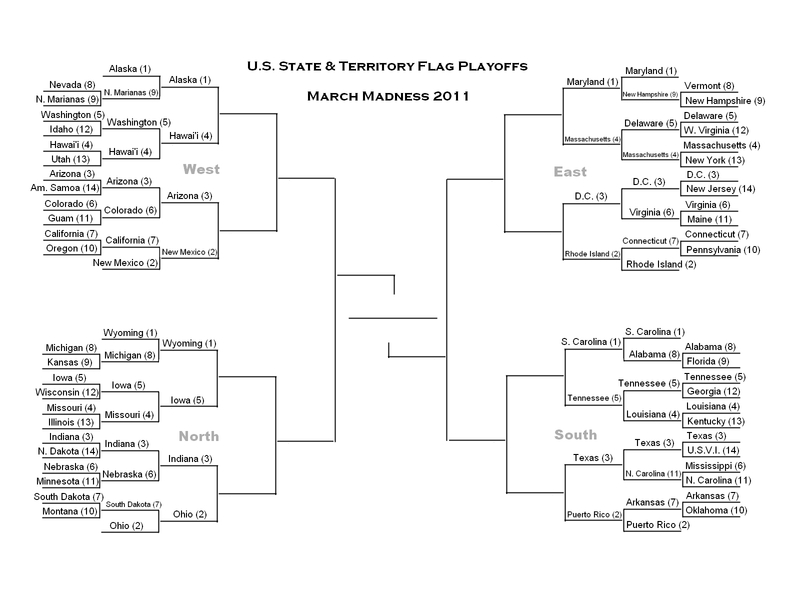 March Madness: North and West Semifinals!!! North and West Semifinals Voting Deadline: 9 p.m. PDT, Sunday, March 20. 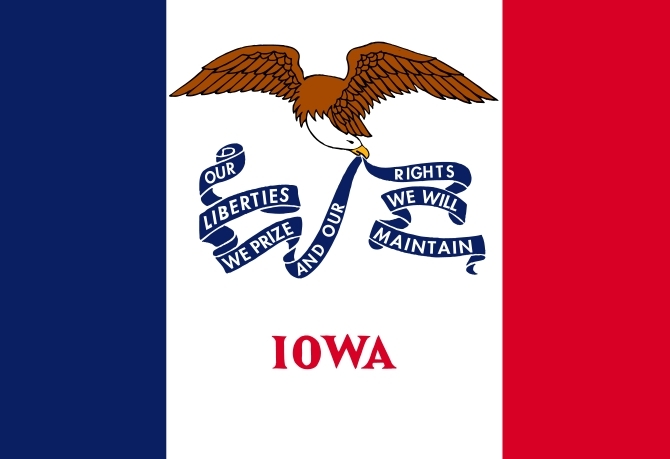 I'm going to go against all of my previous non-eagle votes and go with Iowa here. I like the motto, the color blocking is nice, and there's just something about the seal on top of the buffalo that turns me off. So Iowa. Need you ask? Indiana. 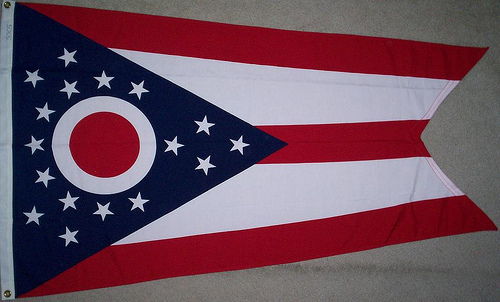 And it's not even really a fair fight because Ohio's flag is kind of weird. 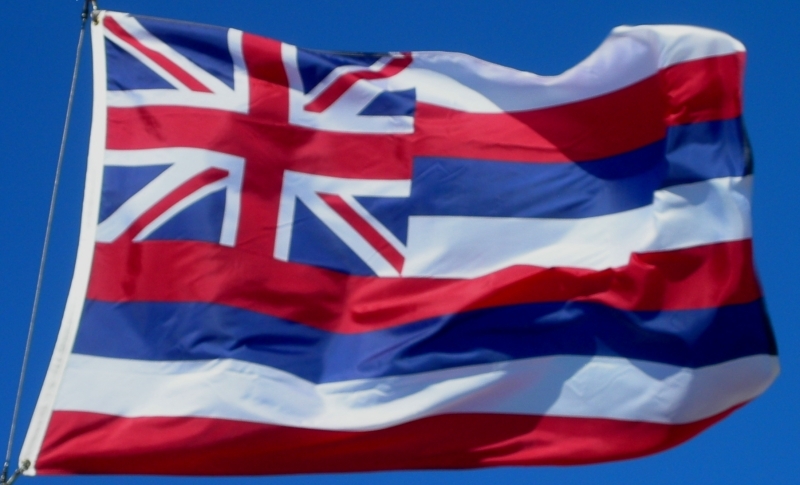 I'm sticking with Hawai'i here. Much more interesting and cheerful. This is a hard one, because I like both these flags, but the offputting puce/peach color of the Arizona star has taken away that small edge it needed to overcome New Mexico's sunny simplicity. The first one is though; both are very good designs. 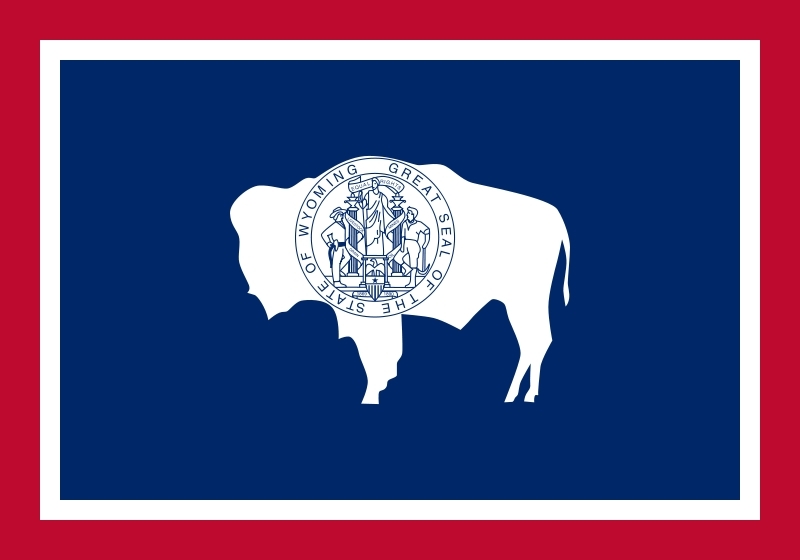 However, the seal on Wyoming's flag gives IOWA a slight win in this matchup. Ohio's flag is recognizable and original, but I find it a little too cluttered. Also, the arrangement of the stars and the eyeball-esque circle ruin it for me. 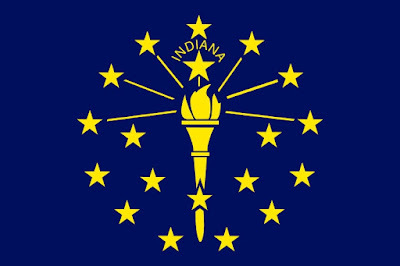 Conversely, INDIANA has a very good star arrangement and the torch looks cool. Also, there's a lack of awkwardly-placed circles. Another tough one; the 49th and 50th states both have really good flags. 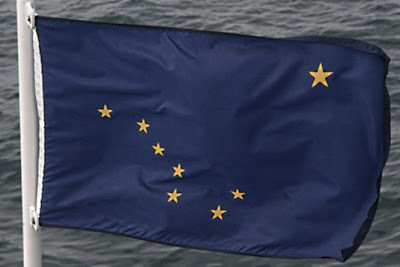 I prefer ALASKA's stars to the slightly overused stripes of Hawaii. Finally, a chance to get rid of Arizona's horrible colors. 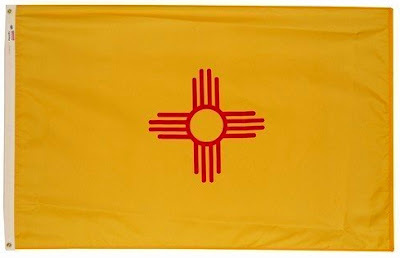 This matchup means that I can save my over-exuberant praise of New Mexico's flag for next week. NEW MEXICO is a clear winner. 2. O-HI-O! cute shape beats sparkler-array. 3. HAWAII! Yea for the 50th State. 4. New Mexico! Adios to Ugly Arizona Star Color! 1. Wyoming. I like the bison, and I hate traditional tri-colors. 2. 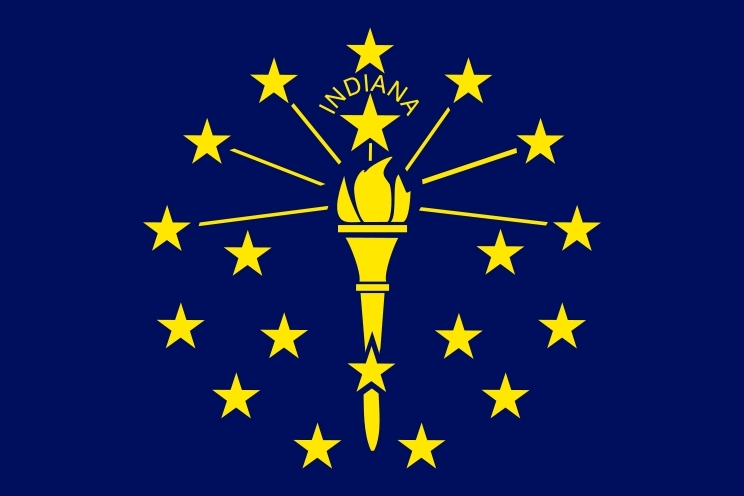 Indiana. Dude... Ohio just looks like it's trying to one-up Puerto Rico. 4. Ooohhh... tough call. 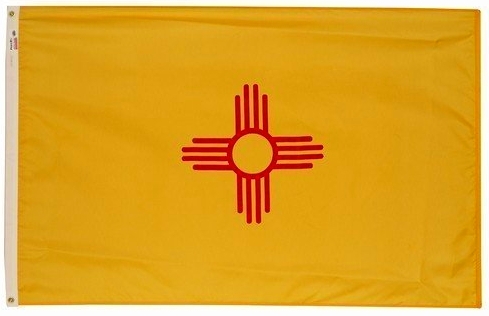 I do love the Wonder Woman flag, but New Mexico's says so much while saying so little. Gotta go with New Mexico. The two go so well together that it's a shame to have to pick one. Same colours, so neither has an edge there. They both use negative space well, and are recognizable from a distance. The coffee ring bison versus the scroll-toting eagle. Both depictions of animals important to the original inhabitants and driven to near extinction by those who usurped the land and raised flags over it. Most of what I can state objectively about flag design should give the win to Wyoming: there's the excessive detail in the eagle's feathers, the writing on the scroll and on the flag, but somehow I just like the eagle more. I think it's because the bison is facing the 'wrong way' for a left-to-right reading culture, and I just don't like the seal there. 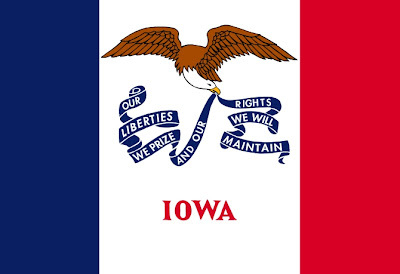 Give my vote to Iowa. What a star-spangled face off. Indiana has nineteen and Ohio has seventeen. I do not, however, intend to award my vote on the basis of star count. I will give it to Ohio because symbolic flaggy features are superior to depictions of a actual objects such as a torch and because Ohio lets a circle stand for the O in its name, rather than spelling the whole word out. I liked Alaska better last week, when it was the new flag on the block in a field where all the others had already come through a round of discussion. Now it looks a bit like a dark blue bedsheet upon which there has been some action. I hope I like it better next week, because previous voting suggests that I may be in a minority for liking Hawaii more and more. 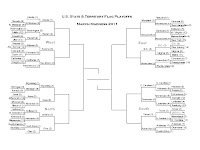 We knew this match up was coming, and I thought I would be choosing New Mexico, but it looks as though it too is a flag that was startlingly cool because of novelty, after getting a bye in the first round. 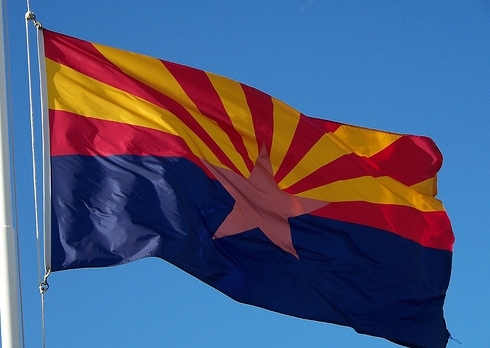 Seeing the two side by side makes me like the copper star and stripes of Arizona better. I've flown over both states at sunrise, and those colours and shapes are real. Wyoming. Aside from being graphically superior, it chooses an appropriate local symbol, instead of pilfering from the national grabbag. Oh, this is tough, because I do admire Indiana's flag, but Ohio's daring dynamism takes the cake for me. 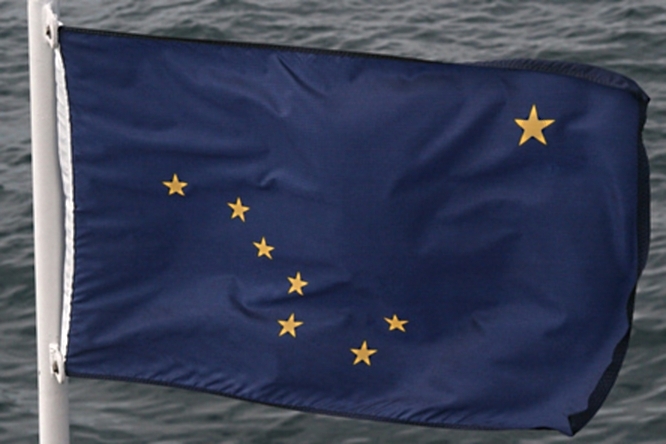 Alaska's elegant and restrained symbolism beats out Hawaii's jaunty colonial trappings. Ooh, battle of the southwest...I should possibly recuse myself for having lived in Arizona for a few years, because apparently I've retained an affection for its rising sunstar...But instead, I'll give the nod to New Mexico, which I think really deserves it.